Hawaiian tropical flowers make a great gift for those whom you want to say ‘hello’, ‘Goodbye’ or wish to communicate your deep respect. The flowers may be given to friends, fellows, honored guests and others. It can make a fabulous welcome and a parting gift to show love and sympathy. 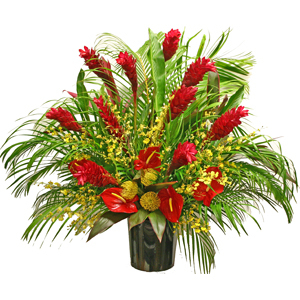 Tropical Flower Arrangements are the unique kind of floral arrangements that present a spiritual, emotional and philosophical kind of connection in a heartfelt and beautiful manner. If you choose Hawaiian flowers to make the floral arrangement, you may be rest assured that the flowers will last for more than 2 weeks. So, your message of love and happiness will be communicated well. When buying a flower arrangement, one can go for heliconias, anthuriums, gingers, dendrodium and birds of paradise. The Hawaiian floral arrangement is the handmade offering that bears utmost freshness and quality. Irrespective of the occasion, whether it is anniversary, honeymoon, wedding, it is important to select only freshly cut flowers for the making of floral arrangement. People notice fresh flowers even more and thus they bring an added enjoyment to any celebration. It is good to choose fresh flowers from the local florist. They are regarded as signature gift for special occasions of life. Tropical flowers can make real floral arrangements that stand out from any other kind of flower. Each of the arrangement will be new kind of creation to draw maximum attention. When you get the flowers, unpack the Hawaiian flowers and do not refrigerate. You may trim ¼ inch from the flower stem and then immerse the stem in water. To make sure that the flowers absorb moisture, cut the stems in an angle. The flowers must get plenty of water and for this consider misting the flowers. This can provide adequate moisture to the flowers. You can trim the stems, change water frequently to ensure water absorption. Keep the flowers out of direct sunlight, heat and cool breeze. It is always good to walk inside the florist store to see the flowers. You should personally experience the quality of the flowers, the feel and the look. It is also good to buy flowers online after having an interaction with the florist. Online stores utilize a lot many tools to render quality customer care service. Find a florist online and capitalize on the internet ordering capability. If you visit a local florist, he can help you choose the best set of flowers and floral arrangements. The very best bloom will be appropriate for your needs. By visiting the store, you may be sure of personally choosing the flowers that would the part of the floral arrangement. A good and reliable florist will suggest you flowers for different occasions. The suggestion of the florist can really make huge difference to the type of tropical floral arrangements you have. There are many stores that offer huge bargains over the purchase of flowers. If you place bulk orders, you will get heavy discounts.